The India Forum on China @Goa, hosted by the Institute of Chinese Studies(ICS) in collaboration with Konrad Adenauer Stiftung (KAS) and Goa University, is being developed as an annual conference where eminent scholars, practitioners, and policymakers hold in-depth deliberations on a topical theme pertaining of KAS had organized the 1st India Forum on China@Goa at International Centre Goa on 15-16 December 2017 in cooperation with the University of Goa to explore the theme of “Deciphering China’s Quest for Global and Regional Leadership”. The 1st IFC @Goa brought together renowned scholars and practitioners from India and abroad to discuss and debate a wide range of issues. Given that it was held shortly after the 19th Congress of the Communist Party of China, the deliberations and outcomes of the Congress too informed the discussions at the Forum. The 1st Forum explored the relationship between China’s comprehensive national power and its leadership and Road Initiative, its efforts to fashion new institutions like the Asian Infrastructure Development Bank, country’s ‘core interests’ as well as nationalistic temperament were considered, along with an examination of the limitations and constraints faced by China in the pursuit of its regional and global aspirations. The geopolitical impact of China’s expanding military capabilities, its evolving security doctrines, and its assertive behavior was examined. The implications of China’s readiness to offer the Chinese path as worthy of emulation by other developing countries were also discussed. The report of the conference can be read here. 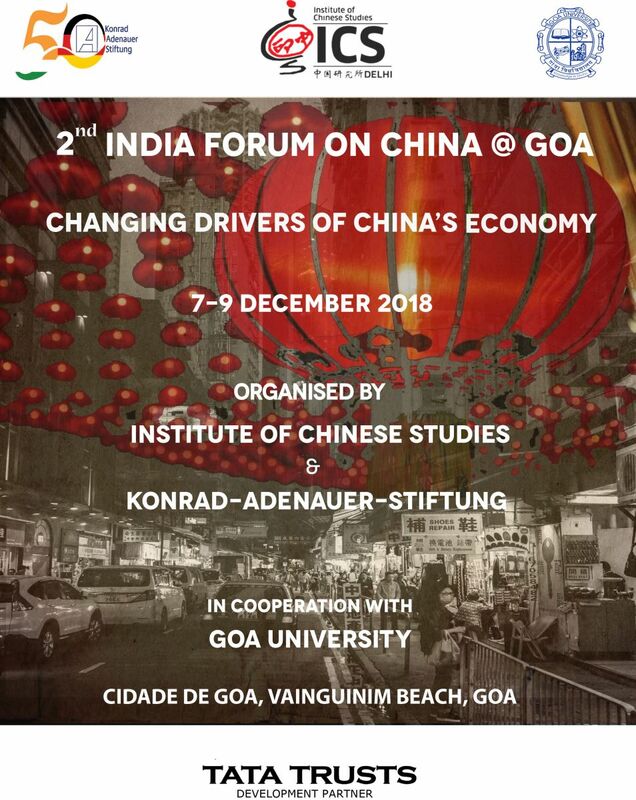 Encouraged by the success of the first forum, the ICS and KAS are now together convening the 2nd India Forum on China @Goa from 7 to 9 December 2017, in partnership with Goa University. As this year marks the 40th anniversary of China’s reform and opening up, the theme of the conference is ‘Changing Drivers of China’s Economy’. China’s economic growth has long driven the global economy, boosted global trade, and led its strategic engagement with the world. Domestically, its development strategies have ushered the largest cohort of people out of poverty ever in the world and transformed the lives of its 1.3 billion people. With an economy of USD $13 trillion, China is closing in on the world’s largest economy, the US, while assuming the reins as the world’s largest trading nation, manufacturer and foreign exchange reserve holder, among other feats, over the past two decades. Recognizing that emerging economies are prone to falling into the ‘middle-income trap’ as also understanding the perils of continued fast-paced growth on the sustainability of the development process, China embarked on a determined program for structural rebalancing for orderly and managed deceleration since 2013. To study the contours of this evolving scenario and determine its outcomes for the world and India, the 2nd IFC@Goa looks at four broad sub-thematic issues of relevance for India and the world under the rubric of ‘Changing Drivers of China’s Economy’ including Structural Rebalancing of China’s Economy: Progress and Spillovers, Xi Jinping’s Innovation-Driven Development Strategy: 13th Five-Year Plan, Made in China 2025, AI 2.0 and More, Belt and Road Initiative: Reimagining External Drivers of Growth?, Unfolding Economic and Strategic Contestation:China and the USA, China’s Role in Changing Global Growth Paradigm:Implications for India. The Forum discussed the nature and implications of China’s leadership quest, evaluated its strategic narratives, and assessed limitations and constraints faced by China in the pursuit of its regional and global goals.